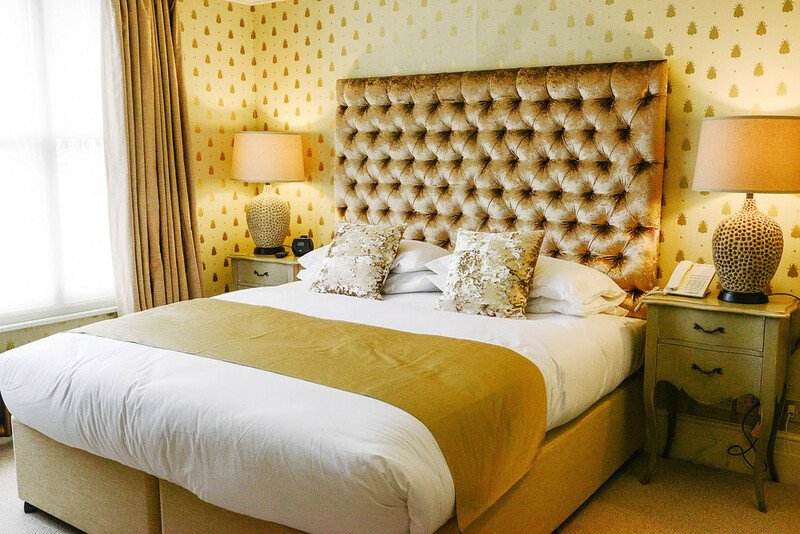 When Lorna Pissaro, Marketing Director and Proprietor of the Long Melford Swan first told me of plans to add accommodation to the boutique restaurant I was quietly excited. At that stage the road ahead didn’t look straight forward – not least because the one vital part of the puzzle, purchase of a neighbouring property, along with all the requisite planning permissions, was yet to be finalised. But in the relatively short time that I’ve known Lorna it’s become apparent that she’s a lady who makes things happen and the recently completed project, Melford House, is testament to her unwavering eye for detail at every turn. But this isn’t the first time that her company, Stuart Inns – which she owns and runs jointly with her brothers Oliver and Iain – has taken a property, stripped it practically to the bone and then reawakened it as a vital and vibrant part of its growing empire. Less than two years ago this successful family team took the Ram public house in the middle of Hadleigh and redefined it as The Hadleigh Ram, now a popular restaurant of note for discerning Suffolk diners. During the transformation from tired pub to classy eatery Lorna’s hand was very much at the design tiller and appreciating what she achieved at The Ram I was eager to see the results in Long Melford. Next door-but-one to The Swan, Melford House had been a family home - a townhouse on the ever popular half mile (or so) commercial stretch of Hall Street at the heart of the village. Perpetually popular with antique hunters there are countless amenities available in this small town; but part of the beauty of the location is that it’s also a very short walk from the front door to the National Trust’s Melford Hall and a few hundred yards further to Kentwell Hall – the renowned Tudor country house and rare breeds farm. Reimagining a space – taking a three bedroomed family home and creating, instead, four perfectly appointed boutique style en suite rooms – is indeed a skill. Each has been lovingly crafted with individuality and personality and while all four are luxuriously appointed the differing shapes and sizes have presented great opportunities to vary the finishing touches. 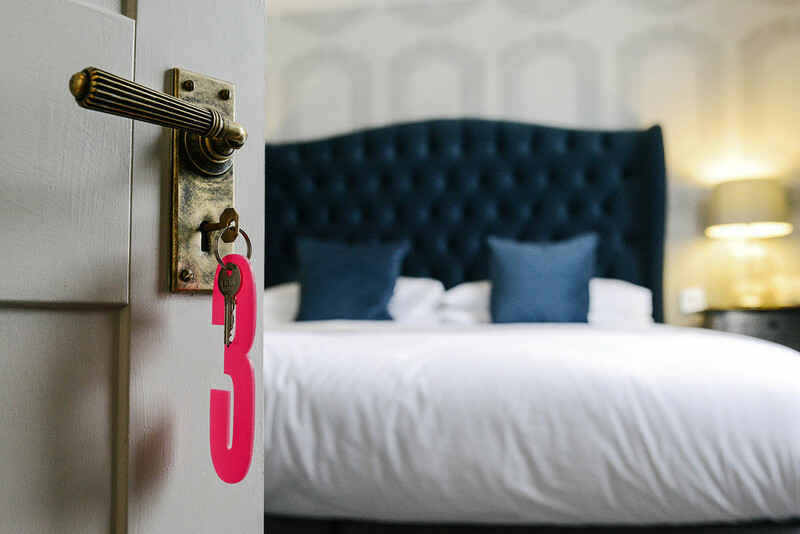 As standard each room boasts a super kingsize Hypnos bed, Egyptian cotton sheets, state-of-the-art television, complimentary Noble Isle bathroom products (which are made in the UK from natural extracts) and free WiFi. 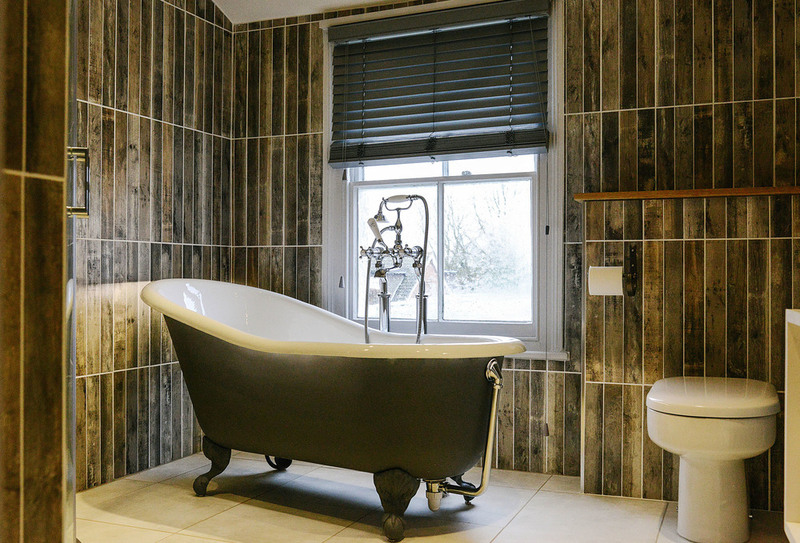 All have fabulous bathrooms, three with free standing baths and all with walk in showers and stunning handmade tiles. For me it’s the more subtle details that add another layer of luxury; the choices of fabrics, individually styled pieces of furniture and wall coverings all add to the uniqueness of each room. Lighting plays a key part in any interior design scheme and it really comes to the fore in the bathrooms Lorna has created. She’s clearly given great thought to morphing from ‘functional morning routine station’ to ‘tranquil relaxation oasis’ and with three clever stages of lighting we move from fully-lit to below-bath-mood-lighting at the flick of a switch. With a couple of hours to kill between checking in and evening meal I have to admit that my first stop was a lengthy soak in the double ended tub while the cares of the day, indeed the week, drifted off with the steam. Relaxed and ready to enjoy our evening meal we headed to the restaurant. This too has had quite a makeover in recent months with the redecoration of the bar and restaurant and the small kitchen converted into a further ‘secret’ dining area – The Pantry – perfect for small parties and used as the breakfast room for overnight guests. The new kitchen, added at the rear of the building, is complete with glass wall for a comprehensive view of Head Chef Thomas Bushell and his team, at work. Although the open fire in the bar was tempting we chose to dine in the candlelit restaurant. I started my meal with an absolutely exquisite fish and shell fish soup. Laced with roasted red peppers and cherry tomatoes it had a deep Mediterranean flavour that was warming and wholesome. My husband chose his starter from the ‘Small Plates’ section of the menu as oatmeal crusted frogs legs with garlic aioli had caught his eye and are so rarely available that he just had to indulge. Mains were a more difficult choice. As with the menu at The Ram, The Swan offers a really comprehensive selection with grill options as well as the trademark restaurant-style dishes, but on this cold February evening the seared wild venison loin with red wine sausage, tomato and bean cassoulet and king oyster mushroom won my vote. If food can be compared to a hug from a warm blanket this was it. Meanwhile Mr R ordered the 500g (yes, a whopper) pork cutlet steak with garlic mash and broccoli. Suffice to say the more-than-man-sized portion almost beat him but not one to take defeat lightly his forced himself to clear his plate – apparently purely for the good of you, our reader! A mixture of chocolate ice cream with blood orange and purple basil sorbet were Adrian’s take on our shared dessert theme as I selected chocolate fondant with orange carpaccio. We decided to count the citrus sides as one of our five-a-day while the chocolatey calories…well they’ll probably still be with us next Christmas but who’s counting? To round things off I’d spotted a chamomile and citrus tea among the selection of Novus teas in our room so decided that retiring to Melford House for a soporific cup would be the perfect end to a splendid evening. Waking revitalised from a wonderfully restful night and refreshed by the powerful rainfall shower, it was time for breakfast. While I always enjoy breakfast – what’s not to like about a ‘full Suffolk’– I sometimes find the menus rather predictable. Gladly this was not the case at The Swan and so, even though we’d eaten very heartily the night before, I couldn’t resist straying from the norm and ordering ham hock bubble and squeak with poached egg and parsley sauce. I can truthfully say I have never seen the dish on a menu before but I would order it every time, it was breakfast perfection. Our stay was short but with driving time just under an hour from home it was enough to recharge the batteries. The team at The Swan take terrific care of their customers, I know we’ll be returning and, with the promise of further rooms above the restaurant later this year, I have a feeling the watch words will be ‘book early’.